REGINA, July 11, 2017 /CNW/ - Input Capital Corp. ("Input", or the "Company") (TSX Venture: INP) (US: INPCF), is releasing its quarterly operations update for Q3 of its fiscal year ending September 30, 2017, which provides a summary of capital deployed in the acquisition of new canola streams and a preliminary summary of canola sales during the quarter ended June 30, 2017. The final accounting of quarterly results will be published in Input's financial statements and MD&A when these are finalized and released in due course. "The whole team at Input is excited about the results of this third quarter," said President & CEO Doug Emsley. "Marketing Streams alone have more than doubled our client count in the last six months and may be a game changer for Input as a company. Last year at this time, Input had 107 active streams, and today we have over 300. And well over half of the new contracts signed in this last quarter have the potential to expand to many times their current size going forward. I want to commend our entire team for their efforts as we look ahead to an exciting future." Signed 142 streaming contracts for a total of $3.9 million in new capital deployment during the quarter, adding 124 new producers and over 59,000 metric tonnes ("tonnes" or "MT") to canola reserves. Recorded $1.1 million of revenue on the sale of 2,294 MT of canola equivalent from streaming during the quarter, at an average price of $498 per MT. Completed the previously announced sale of 4,320 acres of farmland which was received as a partial streaming contract buyback in 2016. Signed an Agreement for Sale on 5,000 acres of farmland received from a contract terminated in November 2015. Under the Agreement for Sale, Input will retain title to the land until certain closing conditions have been met and payments completed. 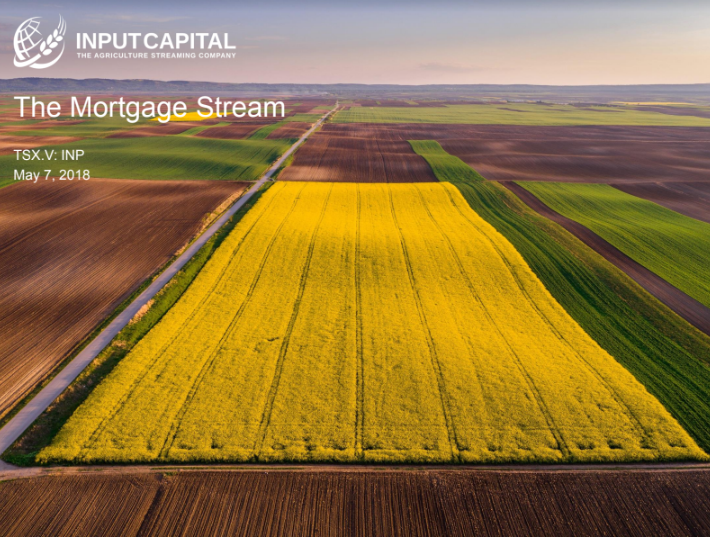 While the terms of the farmland sales will not be made public due to commercial and privacy sensitivities in the tight-knit farming community, Input management is pleased to report that both land sales took place at expected values, resulting in neither a gain nor a loss to Input. During the quarter, Input signed 142 canola streaming contracts. This is the highest number of streaming contracts ever signed by Input in a quarter for quarterly capital deployment of $3.9 million (compared to 21 contracts and $6.1 million in deployment in the same quarter last year). Deployment in the quarter resulted in the addition of over 59,000 metric tonnes ("tonnes" or "MT") to Input's total active canola reserves bringing total reserves to 455,000 MT. Of the 142 contracts signed in the quarter, 124 are with new clients in Alberta (33), Saskatchewan (89), and Manitoba (2), and 18 contracts are renewals/expansions with existing clients. This brings Input's streaming portfolio to 303 active streams in Alberta (69), Saskatchewan (225) and Manitoba (9). For the fiscal year to date, Input has signed 287 canola streaming contracts for total gross upfront payments of $34.8 million. This compares to 77 canola streaming contracts for total upfront payments of $24.0 million during the same nine month period last year, increases of 272% and 45%, respectively. Input sold 2,294 metric tonnes ("tonnes" or "MT") of canola equivalent volume from streaming during the quarter at an average price of $498 per MT, for quarterly streaming sales of $1.1 million. This compares to 250 MT sold in the same quarter last year. Additional canola sales of 2016 crop are planned in Q4 as well as cash receipts from a few outstanding crop insurance payments. These will add to the totals for the F2017 fiscal year. The Company often receives the first revenues from a crop during the last two weeks of its fiscal year, in September. Management believes that these early crop receipts may be negligible this year as a result of seeding delays at the start of this growing season which will push harvest dates further into the fall and crop deliveries into Input's F2018 fiscal year. The table below shows Input's Total Active Canola Reserves, which is the sum of all contracted canola streaming tonnes for all contract years on all active contracts, less canola streaming tonnes sold to date. *Avg Crop Payment is calculated based on an assumed $450/MT average realized canola selling price. Management would like to inform investors that the quarterly operational update for Q4, which will be published in early October 2017, will be the final such quarterly operational update published by Input. Starting in F2018, deployment and canola sales figures will be released in conjunction with quarterly financials, simplifying reporting cycles and timeframes within the Company.